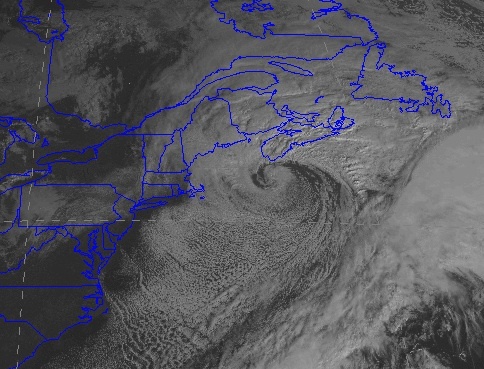 During the last day, a strong Nor'easter (also called Northeasters by some) struck the northeast U.S. with strong winds, rain in the coastal areas, and snow inland. What made this storm so remarkable was the snow. Rarely do such storms bring this much snow so early. Usually the first snow of the season hits the coastal northeast U.S. in mid-December. From this events, some locations are breaking long term records--such as the earliest 1-inch snow for over a century at New York City. This storm is NOT a record for earliest snow over the region---historically, most northeast snow have had some snow as early as mid-October. Snow on trees that are still leafed is a major issue, resulting in lots of downed trees and power outages. The weekend event is an example of a a Nor'easter--a strong, midlatitude cyclone (low pressure center) that moves up the east coast from the southwest to the northeast over the nearshore waters, roughly paralleling the coast. The winds move around such lows in a counterclockwise way, with the strongest winds generally from northeast over the north and western quadrants of the storm. 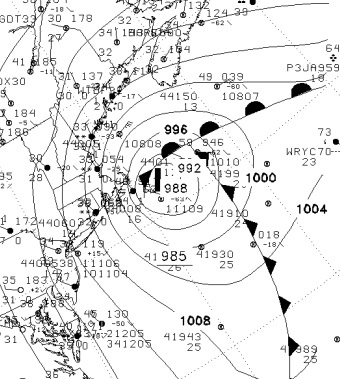 Here is a National Weather Service surface chart at 10 PM PST on Saturday night as an example (solid lines are isobars--lines of constant pressure....the closer together they are, the generally the stronger the winds). Winds are shown by wind pennants at various stations. Nor'easters are cousins to the big northwest windstorms (e.g., the Inauguration Day Windstorm, Chanukah Eve Windstorm, Columbus Day Storm). Both get most of their energy from horizontal variations in temperature--thus they are midlatitude cyclones. This is very different from tropical cyclones, such as hurricanes and typhoons, that derive their power from the warm temperatures and moisture of tropical oceans. Large, impressive systems. For the Nor'eastern event...do you see that lines of clouds extending NW to SE from the coast---that is caused by cold air going over warm water. In general, the very strongest Northwest cyclones are stronger than the top Nor'easters, with our 1962 Columbus Day storm probably being the most powerful non-tropical coastal storm to hit the U.S. in a century. (Beware--those wily east coasters like to call their storms "Perfect" or "Storm of the Century" and get books and movies made about them. Don't believe their propaganda--ours are bigger and more powerful). Before roughly 1990, few of these big storms--on either coast--were well forecast by our numerical models. The 1962 Columbus Day storm came as a big surprise, and the President's Day Snowstorm of 1979 brought unforecast snow to D.C. (very bad place for forecast failures!). But by the early 1990s something had changed. Our models now had sufficient resolution and physics, and satellite information was improving our description of the atmosphere to a point that we began to get these storms right. For example, both the West Coast Inauguration Day Storm (January 1993) and the East Coast "Storm of the Century" (March 1993--I hate that name), were correctly predicted days before. And we have only gotten better in time. Lets see how we did for the current storm. 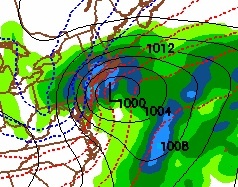 Here is the model analysis at 5 PM on Saturday. 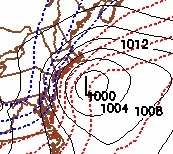 Nice low off the coast, large coast pressure variations. The dashed lines indicate lower atmosphere temperature, with the first blue one indication conditions cold enough for snow. 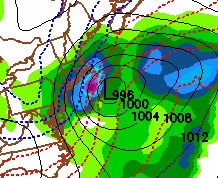 The forecast by the National Weather Service GFS model initialized 36 hr before is shown below...as well as the precipitation forecast (light blue is the heaviest). Not bad! Or how about 60hr before? Still quite good, but displaced a big too far offshore. Keep in mind that some of these strong midlatitude cyclone can have hurricane force winds over water and are the equivalent of category 1-2 hurricanes. And midlatitude cyclones are much larger than tropical systems and do not weaken as quickly when they pass over land. If a big midlatitude cyclone hits the Northwest this year we will have a magnificent view of the details using the new coastal radar. And if our models are wrong about intensity or position, the new radar will enable us to get out timely warnings in time to save property and lives. We have finally caught up to the east coast, where they have had radars looking offshore for decades.